Some 2,500 construction workers in Somerset are building the UK's first nuclear power station in a generation. Many are staying in two campuses built to help cope with this influx of workers on the Hinkley Point C plant. Somerset firms were chosen to run the campuses and to provide food and drink, in an bid to help the local economy. While there were fears over the impact of so many workers, mainly men, coming into the area, police say they have dealt with just a few minor complaints. One worker said staying at the campus meant he could meet people from different walks of life "so socially that's a good thing". The two campus sites, at Bridgwater and Cannington, are both a few miles from the construction site. Front of house worker, Kady Finka, lives in Bridgwater and used to work in a pre-school. She said: "It sounds like a cliché but I really love my job here, the people are amazing. "No, why would you be?" The construction project has a drug and alcohol policy that involves random testing, not being allowed to report for work if under the influence of drugs or alcohol and not consuming any on site at Hinkley Point C.
If anyone is believed to be under the influence they can also be tested and reported. Also anyone caught using illegal drugs will be reported to the police. Ms Finka said she did not think people working there would run the risk of causing trouble in the local area and the strict rules helped ensure that. Lee Bottomley from Yeovil works for Wincanton Logistics. He oversees the paperwork of all the assets going on to the site - which currently stands at about six million items to have gone into Hinkley Point C since he started working there in 2010. He regularly stays at one of the campuses and said: "I don't think it's like a university campus, it's superior to that. "You speak to various people doing the tunnelling, the jetties, to do the marine works - so you get to talk to people from different walks of life that you generally wouldn't get to talk to on the project. "So, socially that's a good thing - there's people from Poland, France, even local people from Bridgwater who come to stay here." From the very start of the project, EDF Energy said it wanted to use Somerset suppliers and employ as many local residents as possible. One example is a local company, Host Somerset which runs the two workers' campuses. 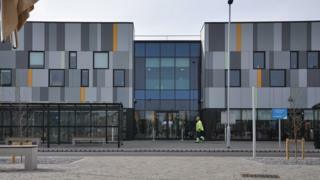 The larger, Bridgwater-based Sedgemoor campus opened in October and can house 986 people. General manager, Paul Warburton said: "We've got 340 staff between both of the campuses and as they get busier the staff bases will move. "This week we've got 120 working out of Sedgemoor and many of them are from the local community and can actually walk to work. "So 24% of all of the team are based within a mile of here in Sydenham, over 70% are based within 20 miles and very few are based outside of that area." Caterers Somerset Larder are local and food is sourced in the area where possible. The ales available are also made in the county. EDF Energy's external communications manager, Andrew Cockcroft, said: "The Somerset Larder and Quantock Brewery - they're prime examples of how we're keeping things as local as we can. "On the supply chain we could have quite easily gone to big national suppliers, a big accommodation facilities management company to run the campus, a big framework contract to run the place, a national caterer to put the restaurant in place, all of that. "But we chose the difficult route, which is helping local companies run the place and work in it as well." Caroline Norris from Taunton oversees the contract between Host and EDF Energy. She used to be an officer in the Intelligence Corps for nine years, working in Afghanistan, Qatar and weapons intelligence. "With any job, the main thing is communication - you need it in the military and likewise you need that here as a project manager for EDF." She said out of 120 people working in site operations, about 60% were ex-military. "There's always some fun and games - the RAF always lose out at the end of the day in any argument. It's all done in good humour," she added. Liverpudlian Peter Henderson is working as a grinder for a Belgian contractor, Socea Denys. He cleans the seals of 40ft (12m) metal pipe edges before they are coupled and welded together. These 17-tonne pipes are for the water cooling system of the nuclear reactors. He said: "There's a lot of men working on the project - although the site is absolutely massive the space that we work in is small, with joiners, steel fixers, concrete pourers. "You put a massive pipe in and the steel fixers have got to fix the steel, the chippies have to put the wood in so the concrete can get poured and that fixes our pipes." As the project gets busier with about 6,000 workers building the power station, all the rooms will be opened up at Sedgemoor Campus. The campus has an expected lifespan of eight years - after this, as it is a modular build, it can be dismantled to allow for new developments.